• Dental sealants are ideal for preventing tooth decay, particularly for young patients. A plastic resin material coats and covers cracks and grooves in the teeth that are susceptible to decay, or cavities. • Fluoride is a natural mineral that can be applied to the teeth to help prevent tooth decay as well as reverse early tooth decay. Dental fillings are placed for the purpose of treating damaged or decayed teeth. We offer composite tooth-colored fillings in addition to traditional, silver amalgam fillings. Root canal therapy may be administered to treat a deep cavity or severely infected tooth. The procedure has traditionally been considered stressful and painful by many; on the contrary, root canal therapy actually alleviates tooth pain while causing little or no discomfort. Post and core build up is necessary for connecting a tooth to a crown after root canal therapy has been performed. Crowns are used to cover the lost tooth structure which could be due to decay, weakened tooth from stress, fractures, to open the bite etc. They are made from Porcelain or a combination of Porcelain with metal and alloys to make them strong and durable. Bridges are a great alternative to replace missing teeth if implants are not an option .They are made of Porcelain or a combination of porcelain with metal and different alloys to make them really strong and durable thus lasting for a long time. Retainers or mouthguards may be recommended to prevent clenching or grinding, or to correct bite problems or misaligned teeth. Tooth extractions involve the removal of teeth that are badly damaged, irreparable, or no longer functional. We always try to salvage teeth before considering extractions, and offer various cosmetic dentistry procedures to help restore your smile if extraction is necessary. 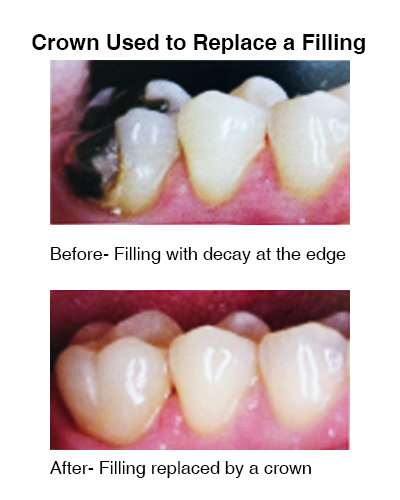 Inlays or onlays restore and strengthen decayed teeth. They are tooth-colored coverings customized to fit your specific teeth. No matter how often you brush and floss, plaque and tartar deposits can still build up on your teeth. A professional teeth cleaning is the single most effective way to remove these deposits and prevent them from causing more serious problems in the future. While a traditional teeth cleaning involves manually scraping away these deposits with special dental tools, advances in dental technologies now give you more options for teeth cleanings, including the use of an ultrasonic device. Root planing and scaling are necessary measures for preventing gum disease from becoming much more serious. The process involves a deep cleaning between the teeth and gums, down to the roots. This prevents gingivitis from turning into periodontitis, which could result in tooth loss. A deep cleaning may be recommended if excessive plaque and tartar deposits have developed below the gum line. Deep cleanings, also known as scaling and root planing, and usually involve a two-part process: first, the stubborn deposits are removed, and then the root surfaces are smoothened. A deep cleaning may be needed to treat gingivitis, preventing the progression to periodontitis. A deep cleaning is also treatment for periodontal infection in order to restore gum tissues to a healthy state.